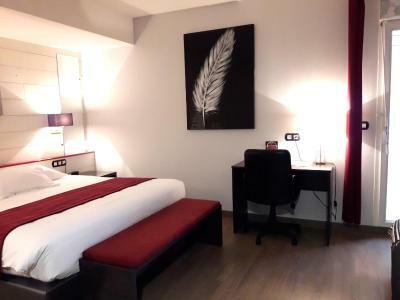 Lock in a great price for Hotel The Originals Pau Ouest Vamcel (ex Inter-Hotel) – rated 8.9 by recent guests! Clean, location, could park my van, staff were friendly.... food was great.. Location of hotel excellent travelling down to Spain. Quiet part of city and brilliant if you wanty to go to cinema across the road. Size of room, quiet, comfortable bed, large shower. Lescar centre town. Proximity to Pau. Some interesting non-tourist restaurants. Room spacious, bright and quiet. Towels and bathrobe larger than average and good quality. Location good for Pau centre, but there are plenty of facilities ( shops, bars and restaurants ) nearby . Excellent bed, quiet room. Air conditioning worked well. Bon petit déjeuner, buffet copieux. Chambre spacieuse et calme malgré la proximité de la route. Personnel agréable et à l'écoute. Restaurant voisin très bien. Je ne suis resté que deux nuits donc difficile d'en dire plus. 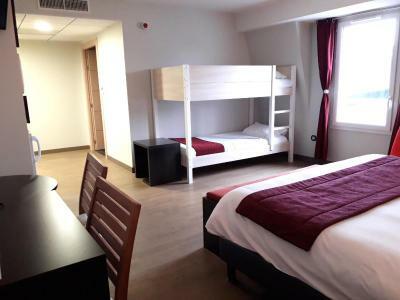 Located 6.2 mi from the center of Pau, Pau Train Station and the A64-A65 motorway, Hotel The Originals Pau Ouest Vamcel has a bar, free Wi-Fi, free parking, 2 fitness rooms and 2 saunas. 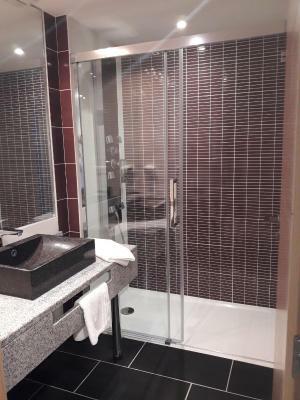 The soundproofed and air-conditioned rooms all have a private bathroom with shower or bath. They also come with a seating area featuring a flat-screen TV and electric kettle. In the morning at Hotel The Originals Pau Ouest Vamcel, guests can help themselves to a buffet breakfast. Pau Uzein Airport is 3.7 mi from the hotel, Henri IV’s castle can be found 6.2 mi away and there is a shopping mall 1,650 feet away. This property is also rated for the best value in Lescar! Guests are getting more for their money when compared to other properties in this city. When would you like to stay at Hotel The Originals Pau Ouest Vamcel (ex Inter-Hotel)? 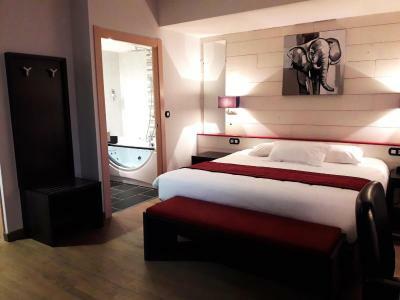 This air-conditioned room has twin beds, a bath or Italian shower, a desk area, hospitality tray and flat-screen TV. 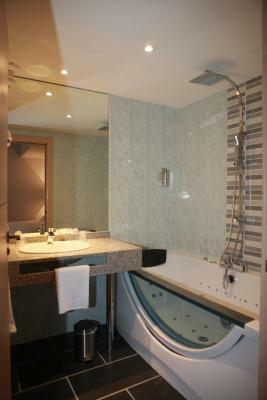 this air-conditioned suite features 2 rooms. The first one has a large double bed, a desk and a kitchenette and the second one has bunk beds, a flat-screen TV and a hairdryer. House Rules Hotel The Originals Pau Ouest Vamcel (ex Inter-Hotel) takes special requests – add in the next step! Hotel The Originals Pau Ouest Vamcel (ex Inter-Hotel) accepts these cards and reserves the right to temporarily hold an amount prior to arrival. Every thing. One of the best hotels of this kind. Location is better suited to someone traveling for business, not being a tourist. Clean, modern decor. Friendly staff. Wonderful all especially the staff. The room we had faced onto the road and was very noisy till late at night and again early in the morning. Breakfast buffet choice was very good. There was a bit of a problem with hot water. Not sure if it was us not using the taps properly, or if the hot water had run out, but the shower ran cold ! Industrial location. Hard to find without GPS.